The New Zealand Dollar has probably started a new uptrend on the back of a series of bullish fundamental catalysts. A recent surprise improvement in employment data, which saw the New Zealand unemployment rate fall to 3.9% from 4.4% and an easing in trade tensions between the U.S. and China, constitute the two primary drivers of the currency's appreciation. The NZ Dollar continues appreciating against the strong Pound and the late October lows in GBP/NZD are seen to be coming into view again. It is thought that a break back below these would open the way to a depreciation down to a potential target at 1.9215, and the lower border of the previous triangle pattern which formed during the first half of the year. The Zealand Dollar however rallied most vigorously against the U.S. Dollar helped by USD weakness from increased political uncertainty following the U.S. mid-term elections. The NZD/USD pair is looking increasingly bullish after breaking above a long-term trendline and extending its uptrend. The RSI momentum indicator is now in the overbought region indicating that the pair is at risk of stalling or pulling-back temporarily. Yet despite this, the break above the trendline and the strong rise which followed are all indicators that in the short-to-medium term the trend could be changing for the Kiwi, which could be predisposed to trading higher. The next target on the radar is the 0.6850 highs, followed by the 200-day moving average (MA) at roughly 0.6900. The MA presents quite a formidable obstacle to the uptrend and there is a relatively high chance it could pull-back or even reverse trend again after touching it. 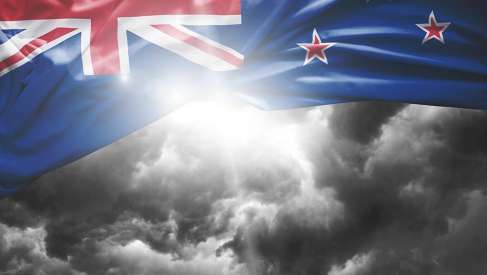 New Zealand Q3 employment data released by Stats NZ was substantially better than forecast and this has been something of a game-changer for the exchange rate, after boosting hopes of an economic recovery. Not only did the annualised unemployment rate fall by half a percent in only a quarter but employment change was also positive, rising up by 2.8% year-on-year versus just 2.0% expected and 1.1% quarter-on-quarter, from the previous 0.5% consensus. The unemployment rate now stands at 3.9%. The participation rate which measures the number of people seeking work also rose from 70.9% to 71.1%, showing more people were joining the labour market. Finally, average hourly earnings also rose by a greater-than-expected amount, up 1.4% versus 0.8% expected, and this bodes well for moribund inflation and interest rates, another positive driver of the currency. The data means that the Reserve Bank of New Zealand (RBNZ) is now unlikely to cut interest rates as some had feared and more likely to raise them eventually, although they are not seen as likely to do this until after 2019. Analysts say the RBNZ will probably revise up its growth and inflation forecasts scheduled for release this evening (20.00 GMT), Wednesday, November 7, and this could lead to further gains for the Kiwi if the revisions are substantial. Economists with Citi believe higher NZ non-tradeables CPI is more likely than a GDP growth decline and therefore retain their existing view that the RBNZ embarks on the first rate hike in Q3 2019. Citi analysts also expect the RBNZ to revise upwards its GDP and CPI forecasts for 2019 in this week’s meeting. We will be watching the Reserve Bank of New Zealand overnight. At 20:00 G.M.T. the RBNZ delivers its interest rate decision and markets are forecasting the Bank to keep rates unchanged at 1.75%. The Monetary Policy Statement (MPS) will however be keenly watched as it will give some guidance as to how the RBNZ expect the economy to progress over coming months; this will crucially give markets a steer as to whether the next move at the Bank is likely to be an interest rate rise or a cut. Watch the press conference from Governor Orr at 21:00 G.M.T. "The RBNZ’s Monetary Policy Statement will take centre stage this week," says Sharon Zollner, Chief Economist with ANZ Bank in Aukland. "we expect the RBNZ will remain cautious about the medium-term outlook and reassert a dovish tone." If correct, the event might well play out to be a bearish one for the NZ Dollar. The MPS does however come hot on the heels of some good labour market data released overnight. It was reported that New Zealand employment grew 1.1% on a quarterly basis in the third quarter 2018, more than doubling the 0.5% forecast held by markets. The participation rate grew to 71.10%, as opposed to staying at 70.90%. The unemployment rate plummeted to 3.9%, down from 4.4%. These are undoubtedly welcome developments for the Kiwi and help justify the recent good run we have seen in the currency.